This commercial cover was sent from Vientiane. Vientiane is located in Laos midway on the northern border of Thailand. Continental Air Services, Inc., operated a fleet of airplanes in support of the war in Viet Nam. of Canada Limited in Dowsview, Ontario. The letter was probably related to some service or spares request for their motley fleet of aircraft. honoring the That Luang Religious Festival (Scott C95). There are three of what I believe are Vientiane CDS. 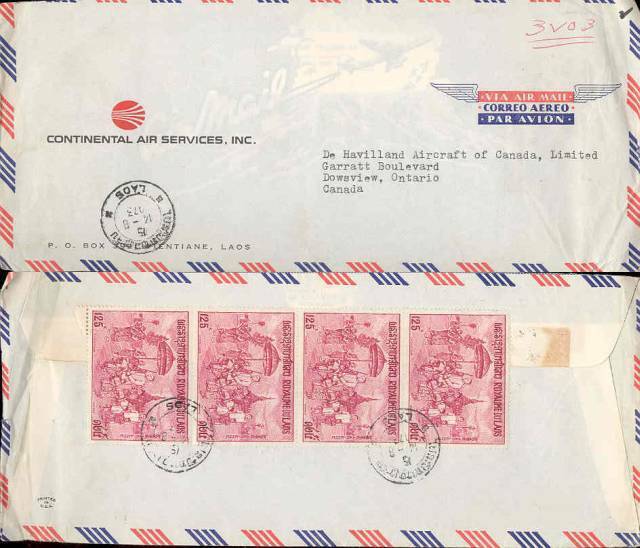 The envelope is a typical #10 airmail envelope of the era.